Dr. Lorenc is responsible for many patents–one of the most notable is a bio-absorbable soft tissue suspension device, US Patent No. 5,611,814, issued in 1997. The invention of this revolutionary device made procedures less invasive, thereby allowing patients a quicker recovery. It eliminated the need for external metal screws in some procedures, which often required a secondary procedure for removal, and also replaced the use of visible stitches with tiny, nearly undetectable incisions. Considered an anatomical facial authority, he is a pioneer in the development of the latest generation of dermal fillers and neurotoxins, leading several clinical trials, such as the pivotal study of Restylane®. As the sole aesthetic plastic surgeon involved, Dr. Lorenc headed the largest clinical trial site and tracked the safety and efficacy of Restylane® in a double-blind study of more than 100 patients over a twelve-month period. Subsequently, he was selected to lead the team of experts who presented the resulting data on Restylane® to the FDA Advisory Panel, resulting in confirmation for its use in the United States in December 2003. Much more effective and longer lasting than its predecessor, bovine collagen, Restylane® became [and still is] one of the leaders in facial fillers. He continues to participate in many ground-breaking studies every year, investigating the safety and efficacy of new devices and procedures. A sought-after public speaker by leading medical societies and universities, Dr. Lorenc travels the globe making presentations, teaching and lecturing. He is a frequent contributor to medical journals, including theJournal of Dermatologic Surgery, the Journal of Drugs in Dermatology, Aesthetic Surgery Journal, Plastic and Reconstructive Surgery Journal and Aesthetic Plastic Surgery Journal among others, as well as editing medical publications and contributing chapters to aesthetic surgery textbooks. He is the author of the international bestselling book, A Little Work…Behind The Doors Of A Park Avenue Plastic Surgeon (St. Martin’s Press, 2004), a revealing look inside the exclusive and evolving world of aesthetic procedures in New York City. He has appeared on The Today Show, Dateline; WNBC’s Today in New York; the CNN Presents documentary, The Fountain of Youth; Good Morning America, The View, 20/20, WABC’s Eyewitness News; CBS’s Morning Show; WCBS’s Evening News; Fox News and the Oxygen Channel’s Life in Style. He has been widely quoted in major consumer magazines and newspapers about new aesthetic surgical and non-surgical procedures. They include Allure, Condé Nast Traveler, Cosmopolitan, Departures, Elle, Family Circle, Forbes, Glamour, GQ, Harper’s Bazaar, Lucky!, Marie Claire, More, New York Magazine, Newsweek, Psychology Today, Redbook, Shape, Smart Money, Tatler, The Chicago Tribune, The Daily News, The New York Post, The New York Times, The Sunday London Times Magazine, The Times of London, The Berliner Zeitung, The Wall Street Journal, USA Today, US News & World Report, Vogue, W, and Women’s Wear Daily. Dr. Lorenc is board certified by the American Board of Plastic Surgery, a fellow of the American College of Surgeons and a member of the American Society of Plastic Surgeons, the American Society for Aesthetic Plastic Surgery, International Society of Aesthetic Plastic Surgery and others. He operates in his fully AAAASF Accredited office-based surgical facility. This accreditation ensures patients that the surgical facility implements best practices in health care and complies with nationally recognized standards. Many private insurance carriers recognize accreditation by AAAASF for reimbursement of covered procedures. Dr. Lorenc is affiliated with Lenox Hill Hospital and Manhattan Eye, Ear and Throat Institute, in New York City. 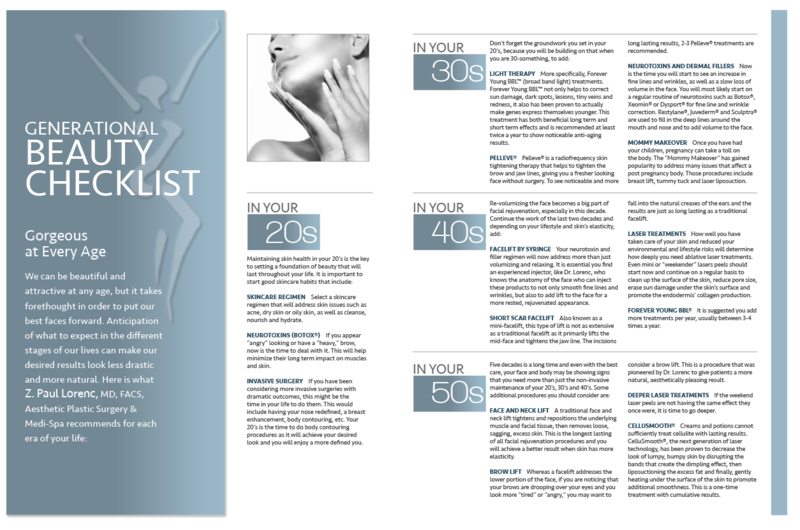 Aesthetic plastic surgery is sometimes called “surgery of the soul” because improving the way you look and feel about yourself enhances your everyday interaction with family, friends and business associates. In this regard, aesthetic plastic surgery is a unique medical specialty that requires both specific expertise in science and surgical techniques as well as a highly developed artistic sensibility. For Dr. Lorenc, it is this convergence of art and medical science that creates remarkable, positive changes in the way a person looks and feels about themselves. 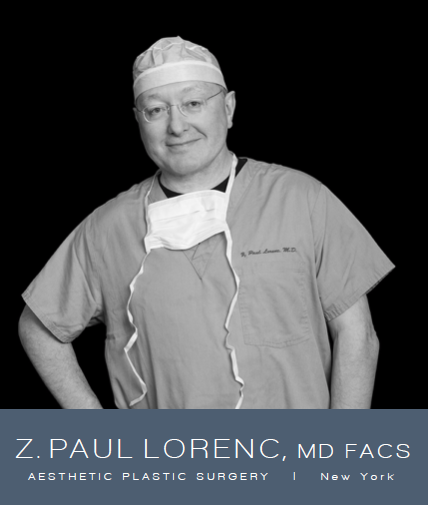 As a pioneer in the development of many cosmetic surgery advances, Dr. Lorenc can also attest that, thanks to medical and technology breakthroughs, life-enhancing aesthetic plastic surgery options are more effective, longer-lasting and safer than ever before. During your consultation with Dr. Lorenc, he gains an understanding of your personal goals and expectations and personally recommends the procedure or combination of procedures that are appropriate for your situation.